When it some to getting a great natural detox you can feel the cabbage diet give you the detox tool to lose weight the healthy way getting full eating less. The cabbage diet plan unlike the cabbage soup diet and similar negative calorie diet plans that help you get a natural detox is great if you are looking for a low maintenance weight maintenance method to reduce calorie intake starting with satisfying your appetite. Is eating cabbage good for weight loss? If you've ever started into eating a meal and find yourself going above and beyond the amount you expected to eat overeating, The Cabbage Diet may be just the method you've been looking for to reduce calories while pinning down your appetite for success in losing weight. Just by eating cabbage before a meal you can satisfy your appetite eliminating hunger making it easy to reduce your calorie intake in your meals as well as get fiber in your diet great for improving bowel movements that is like hitting two birds with one stone in weight loss and your health. In this daily take on Slism, we dive into the cabbage detox diet to help your lose weight giving you an effective detox in only minutes a day before eating your daily meals, the benefits of eating raw cabbage, and difficulties people have with keeping the diet up for long periods of time. The cabbage diet not only acts as a great negative calories diet weight loss program but in addition is also referred to as the cabbage detox and you know what that means. Start eating still getting full while bridging the health benefits of eating cabbage into your diet. All you have to do to get started on the cabbage detox diet is eat 200g of raw cabbage chewing slowly before proceeding to eat breakfast, lunch, or dinner. Cabbage calories are 46Cal per 200g. When you want to add flavor to cabbage using either salt or oil free salad dressing is recommended. Using mayonnaise highly discouraged. 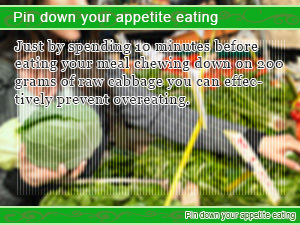 After eating your share of raw cabbage you can proceed to eat as you normally would as if you were not on a diet. Although there is always the chance of overeating, there are no strict dietary restriction and calorie limits to talk about eliminating needless worry. By spending only 10 minutes a day chewing cabbage before starting your mean meal, you can alleviate appetite satisfaction related issues in your diet making it easy reduce food intake. Tate means getting full eating less. What more can you ask for. There are many ways you benefit from eating cabbage in your diet not limited to dietary fiber to improve nutrient absorption while promoting healthy bowel movements such as vitamin C having an anti-aging effect on the complexion of your skin. Where most people's diets start to fail is the lack of one or another component off any healthy diet. Not getting enough fiber in your diet can be obstructive to losing weight. Cabbage is an excellent source of dietary fiber that means improved bowel function a cleaner digestive tract upon consumption that means improved nutrient absorption. It is said that constipation can be an occurring issue in your diet especially while dieting. In fact, being constipated can be the reason why you gaining weight due to the negative effects it have on your metabolism. Relieving constipated related issues may be the right step forward in your diet. Eating raw cabbage helps you bring out maximum nutritional value in store when you eat cabbage reducing loss of nutritional value through exposure to heat. What you get is a good source of vitamin C and vitamin K.
Vitamin C in cabbage aids in the creation of collagen as well as inhibiting melanin to help you get better looking skin giving you true antiaging. Let's face it, have no problem in putting on the same shirt everyday, you are not going to enjoy the cabbage diet without alterations. There are always ways to improve how well you enjoy your diet. All you have to is spice it up and never neglect your body forgetting about other aspects of dieting. One deterrent that many people have with continuing on with the cabbage diet is that it is said to be so easy to get bored form eating cabbage in every meal. For those not inscribed to the doctrine of daily poison to lose weight, this fact may steer you away from the cabbage diet. While on the cabbage diet people often forget the importance of getting an adequate amounts of protein in your diet to avoid unwanted loss of muscles mass slowing down your metabolism making it harder to lose weight and easy to put on pounds of fat. Never forget to get enough protein in your diet. Soy products such as healthy natto and tofu in addition to chicken eggs, meat, and fish are great sources for high quality protein you can trust. It is recommended that you get at least 70 grams of protein in your diet. That's roughly 1 pack of fermented soybeans. Is grapefruit as good as they say it is for you? If it weren’t then there would be no grapefruit diet to be talking about anyway. Fruit diet plan to control appetite. If you are looking for a way to reduce calorie intake without taking away one of your plates then the cabbage diet may be just for you. Just by spending 10 minutes before eating your meal chewing down on 200 grams of raw cabbage you can effectively prevent overeating. 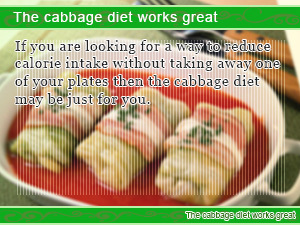 Maximize the nutritional value in your cabbage diet eating it raw. 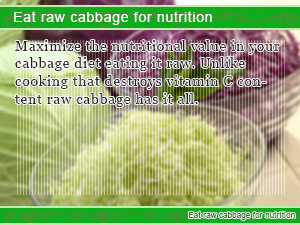 Unlike cooking that destroys vitamin C content raw cabbage has it all.